Anyone looking for something a little different that is very easy to play at the online casinos is going to love our Pot Luck Slot review. This is a game that might seem very basic but you would be very surprised at just how many players have been enjoying it since its release back in 2014. There are no reels as such, no game features and no bonus rounds, so you are essentially buying a game and hoping that it reveals a big win. It is not too different to a scratch card in that sense. However, as this game has proved via its popularity at the online casinos that offer it to players, there are many out there that like this simplistic approach to online gambling. Not everyone wants to have to understand a multitude of features or wait for mini-games, free spins or whatever else to finish before finding out if they have won. They prefer instead to have a quick and pure gamble that will show the results in an almost instantaneous manner. That is the beauty of Pot Luck and the reason it has earned so many followers at online casinos such as William Hill and LeoVegas over the years. It is quick online gambling that is ideal for those of you that are not concerned with fancy game features. Set up by a bunch of professionals that have decades worth of experience in the gambling industry, they aspired to become one of the best developers of casino games across all types of media. Realistic Games is a UK based company that was originally launched back in 2002 from Berkshire in England. It was not until 2005 that Realistic Games started to really concentrate on the online gaming market and for the subsequent four years they provided six casino table games via third-party providers to online casinos such as BetVictor, Bet Fred and Bet365. In 2008 they came to the conclusion that they wanted to stop delivering their games via third-party providers and instead went solo. They are now officially licensed and regulated by the Gibraltar Gambling Commission and are making huge steps towards achieving their goal of being recognised as a leading developer of online casino games. We look forward to following Realistic Games to see what they are able to do as we believe that these guys are a group of very talented people that will no doubt go very far in the online gambling industry. 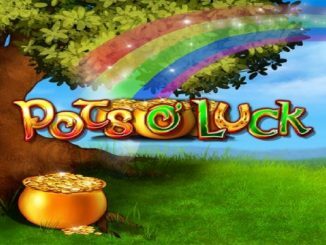 The theme to Pot Luck is quite obvious as it is about that infamous fairy tale of finding a pot of gold at the end of a rainbow. Could I be lucky enough to find such a welcome surprise when playing this slot? 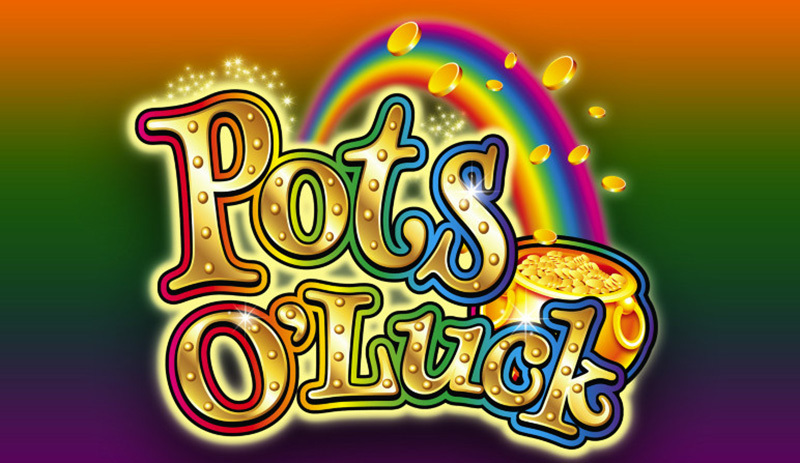 With a real Irish feel to Pot Luck, you will be hoping that the luck of the Irish rubs off on you, especially considering the top prize could bring you 2000x the cost of the card that you bought in winnings. As Pot Luck is designed to be an easy to play scratch card type game, you shouldn’t really expect too much of the graphics. This is not to say they are bad, just to say that this is essentially designed to look like one of those old pull tabs that you could buy. They have done a good job and the graphics are more than adequate for what Pot Luck is supposed to be. The animations when the pull tabs are revealed are very smooth and the rainbow and the green fields in the background have been drawn well. There might not much in terms of gameplay on Pot Luck, as all you are really doing is revealing paylines to see if you have won. However, as mentioned, this game has not been designed to be fun to play and is just there to be lucky for you or not so lucky. 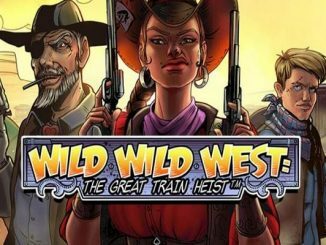 What has to be said about this excellent and enjoyable casino game is that it has the potential to payout big due to a high variance and a respectable return-to-player percentage of 95%. In fact, there is the chance to win as much 200,000 credits for players that are bold enough and lucky enough. Could you imagine what you could do with that sort of money? That really is the sort of amount that could be classed as being life-changing. You are greeted with a Leprechaun that seems to be taking it easy, resting up against a rather attractive looking pot of gold with a delicious looking pint of Guinness being held in his hand. He obviously thinks it is going to be a stroll in the park for you to win some money – so the signs certainly look good. Above the content looking Lebrechaun is a pay table that shows you what you can expect to win should you make the winning combinations described. 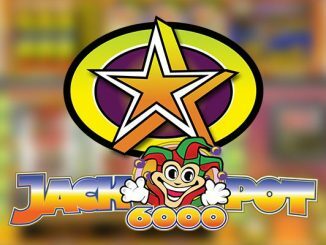 Based on the old pull-tab games that you would physically buy, the idea of Pot Luck is to pull away the four pull tabs in the hope that you make one of the aforementioned winning combinations in that paytable. Of the symbols you will be wanting to match up, you will see the likes of cherries, oranges, melons and the higher-paying symbols of the bronze, silver and gold coloured pots. These are the only symbols you will find underneath the slots but they are all you really need. 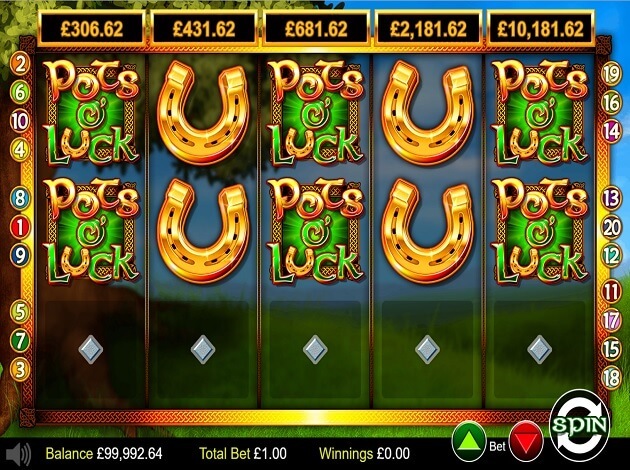 The highest paying symbol on the reels is that of the gold pot of gold that should you match it three times across one of the four pull tabs, you will get a payout of 500x your total bet. Manage this across all four tabs and that is 2000x your total bet and the maximum possible outcome on this online casino game. As each card can cost anything between 0.25 and 100.00, that leaves a possible 200,000 for players to bank. Definitely not a bad result for such a quick and easy game right? Changing up your bets is done very easily and takes nothing more than a few clicks before you are ready to start revealing your potential wins. Just make sure that you select an amount that is within your budget and you are good to go. If you have a set amount you wish to bet and know how many cards you are going to be buying, you can always use the autoplay features which will play tens games in a row before stopping. This lets you get on with other things and you can just come back to check if your balance is up or down. Can Pot Luck Be Enjoyed On Mobile? Absolutely it can and that is what adds to its appeal. Mobile gamblers do not always have the time to spend spinning reels and waiting for bonus rounds such as free spins rounds to end. They are looking for an instant result while they are on the move away from home. Pot Luck is available in many online casinos that are mobile optimised in whichever way. This could be through providing an instant-play ability that allows players to instantly play their games through the web browser on their device or it could be through downloadable software or apps. All platforms such as Android, iOS, Windows 10 and all desktop operating systems will be able to enjoy Pot Luck without any problems at all. All screens no matter the size will be accommodated for due to the excellent mobile-optimisation software that online casinos use today. Where To Play Pot Luck? 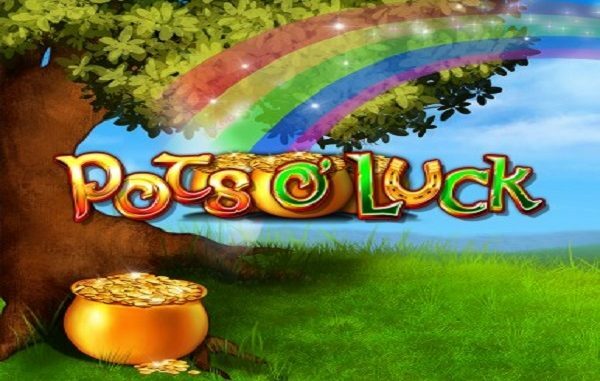 Pot Luck by Realistic Games can be found across various online casinos that accept UK players. This is mainly down to Realistic Games being a UK developer and obviously being able to target UK casinos a lot easier. If you have limited time, prefer playing casino games that are a little quicker and less complicated than online slots or table games, Pot Luck by Realistic Games is something you should definitely consider playing. All you have to do is buy the cards and click to reveal if you have managed to get lucky and possibly win your very own pot of gold at the end of a rainbow. With some big rewards on offer and some value for money online gambling with an RTP of 95%, Pot Luck is perfect for some quick yet highly effective online gambling. In much the same way that you would buy a scratch card from a local retailer, you simply reveal what is underneath to see if you have managed to improve your bankroll. Could it be an astonishing 200,000? Other reasons to play Pot Luck include the fact that it can be played on almost all mobile devices no matter the platform. 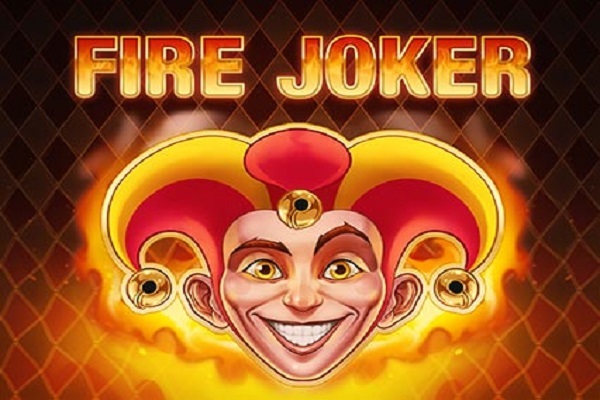 This makes it an excellent choice for an online casino game to play if you do not have too much time and manage to steal a few minutes during the day to have a quick gamble. Even if you do have more time, there is nothing wrong with using this more efficient way of gambling your money in the hope of turning it into a substantial win. We really enjoy playing Pot Luck, especially when we are playing on our mobile device and have a few minutes to spare when waiting for an appointment or in a queue at the post office or something. It is the perfect mobile gambling game for situations like that as you get instant results without having to put much of your own input in. As you would have learned from reading our Pot Luck Slot Review, this games has some excellent rewards that could be as high as 200,000, is available at some of the best online casinos for UK players and is one of the easiest gambling games to play online. Check it out today and you will see why we have praised this game as much as we have. Which Online Slots Payout the Best ?